Today’s interview is with my friend Emmanuel Eleyae, who runs SatinLinedCaps.com along with several members of his family. What I find interesting about Emmanuel’s story is that he tried a bunch of different marketing tactics early on with his online store and they all failed. And then he tried influencer marketing using You Tube and hit the jackpot. 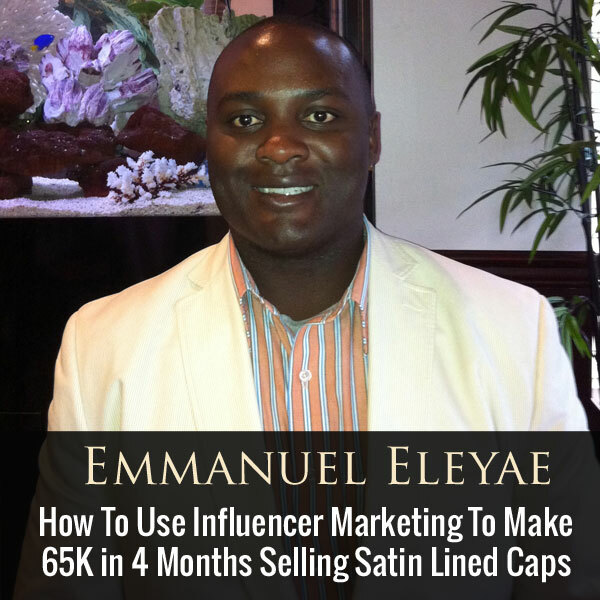 In this interview, you’ll learn how Emmanuel found famous You Tubers to promote his products and the services he uses to continually market his satin lined caps. You also learn what it takes to create your own textile based product from complete scratch. Enjoy the interview! Now if you enjoy this podcast please leave me a review on iTunes, and enter my podcast contest where I’m giving away free one on one business consults every single month. For more information, go to www.mywifequitherjob.com/contest. And if you are interested in starting your own online business, be sure to sign up for my free six day mini course where I’ll show you how my wife and I managed to make over 100k in profit in our first year of business. Go to www.mywifequitherjob.com for more information, now onto the show. Steve: Welcome to the My Wife Quit Her Job Podcast. Today I’m thrilled to have Emmanuel Elea with me on the podcast today. Now Emmanuel is someone who I ran into virtually on the ecommerce fuel forums and after hearing his back story I knew I wanted to have him on the show. Now Emmanuel and his sister sell satin lined caps, which are caps worn to protect hair from harsh conditions and extreme weather, and I was just chatting with Emmanuel before the interview before I hit record and it turns out to be a family business which I find very cool. Now here’s the thing while their product is completely unique, it’s actually hard for them to market effectively because to the uneducated buyer these caps are just another article of clothing and as a result Emmanuel had a very hard time marketing his caps early on until he struck gold with a marketing medium that I’ve actually yet to try with my store and I’m eager to try after talking to him. And with that intro welcome to the show Emmanuel, how are you doing today man? Emmanuel: I’m doing great. Good to be here. Steve: Yeah so give us the background story and tell us about how satinlinecaps.com came to being, how you hooked up with and decide to make this into a family business with your sister. Emmanuel: Sure absolutely, so about a year ago a year and a half ago, we took a read of “The Lean Start Up,” and I was working at Amazon performing at the time line performance when I was there. My sister actually we read it and we actually talked– she had an idea, she was in school for fashion at the time making clothes. So she had a problem that she had and she created a product, a satin line cap to help her you know because all the stuff in the market you know satin bonnet or other silk wraps and things like that and she kind of make it look like Angel Mimer walking around the house. She wanted to be fashionable so she came up with the idea said hey she came to me a little while ago, about a year ago and said I have this idea, what do you think? I said well Lean Start Up stuff we’ve been reading ask 30 people what they think and everyone she talked to gave great reviews and they really loved it. And so I all right looks like we’re on to something, we put on Etsy, initially got some traction, got to about selling one or two a day and I said all right I think we’re on to something here. So I actually quit my job and my fiancé quit her job, and we decided to do it full time. Steve: So you quit your job before it started making significant money? Emmanuel: Leap of faith but at the same time I was a little bit ready, I was in the [Inaudible] [00:04:01] world and I had done that three years. I was in the military before Amazon and I have always wanted to do something entrepreneurial and here we were with a product where 30 different people spoke highly of it. So we were like why don’t we test it out, we ran 1000 units repeat to kind of test it out and it started going, so it was like I think this is time. Steve: So let’s discuss the validation process here a little bit. So you mentioned you sold on Etsy and you asked 30 friends. Is there anything else that you did to just kind of give yourself the courage to take that leap of faith? Emmanuel: Really it was– she asked her friends and then also I went around asking. So there were folks that I knew and some other ladies that I’ve been talking to kind of make it people that don’t know her potentially. And so every time I started talking to them they were like yeah I’ll take it, and I also asked would you pay for it? You know which was the big question and they all said yes, a resounding yes. And they would describe to me the problem because I really don’t have hair, I’m bald and I know you can’t see me, but I don’t fully understand all that goes into hair care. They started to explain to me the concept and once I knew the people I was talking to were able to speak to me about what my product does, it was like okay I think we’re on to something here and that was enough for me. Steve: Okay and then what’s kind of cool about your business is it’s a family business and it kind of spans all across the globe. So how did you kind of get all your family members on board and how does the interaction work since everyone lives in a different place? Emmanuel: Sure it does get challenging, there’ll get challenge in time out of miscommunication at times but we do focus heavily on you know weekly meetings just to get everybody circle back in. We do Skype calls and a lot of phone calls. I’ve got my dad in Nigeria who helps to sell, and we have some relatives there. My sister is in Chicago right now going to school for journalism. I’ve got another sister and my mom down in Southern California who do the finance and some of the marketing, and me and my fiancé here we run the warehouse and do the operations. So we’re all over the place and we just focus on regular communication. Steve: That’s cool, so I actually run a class as you know and a lot of my students are kind of interested in creating articles of clothing. So I’m a little curious how did you get your caps designed and manufactured, and can we just kind of go through that process? Emmanuel: Sure we can and this is where my sister did the lion share. She did it all with help from my other sister and my mom, but she kind of was going through school and taking classes on making clothes, probably through January through the spring of last year. So she studied patterns and you know came up with the idea for the cap and it became challenging at that point– how do I scale? So she started looking around and researched contract manufacturers. At one point we were thinking of going with American Apparel which I didn’t even know they offered you know time on their machines to run stuff for you. But we were actually able to find three or four manufacturers and through just the sampling process she would send them cut sheets and different specs for them to design out. They would send her back a sample, and the one that looked the best was the factory that we worked with down in Los Angeles [inaudible 00:07:12] factory. And it looked the best and they did a good job, so that’s where we chose to do our limited running and we’ve been using them ever since. Steve: So how did you actually find these contract manufacturers? Emmanuel: Have a breakdown of here’s you know people who do manufacturing for this and some people who do manufacturing for that and I think Thomas Ned does some stuff like that try to aggregate a lot of different manufacturer’s state site. Steve: Okay and then in terms of the design it was completely done by your sister? Steve: So you didn’t have to hire anyone to do that? Emmanuel: Yeah, so it’s actually one of those like things in the story that always intrigue me that she went back to school to learn how to make clothes, and she took about three or four classes and she learned just enough to solve the problem that she had and she was done with school. So she was in the right class that taught her how to work with fabric, cut fabric, build sheets and specs, and different things and once she felt comfortable we went forward. Steve: Okay and at any point did you actually consider doing any of the manufacturing overseas or were you planning on doing it in the US the whole time? Emmanuel: As I said we launched the business since September 1st so we’re only about five months old or six months old or so. And it’s just a matter of time now just researching and figuring out who to go with. I’ve heard enough horror stories that it should be approached with caution. Steve: Just for the sake of the listeners, one of the reasons why I had Emmanuel on is because he had– he actually had really explosive growth early on in the first couple of months of his business. I actually don’t remember the numbers Emmanuel, would you mind sharing what your first like two months numbers were in terms of your caps. Emmanuel: Sure, it’s actually a funny story because I remember in September– September through October we were selling on Etsy and we were getting one to three a day, and it really wasn’t moving. So I set a goal you know let’s get to five slaps a day you know and then we hit this YouTube thing like I mentioned earlier. We took off, we were selling over 100 a day, so in about two and a half months we sold about $60,000 worth of product, completely emptied out our inventory for our MVP, and had 350 back orders before we could even get more inventory ready. Steve: That’s awesome. Yeah so more on the manufacturing side, so you’re getting stuff I guess you mentioned in LA. How does the pricing differ between manufacturing in the US versus overseas, and is there a huge price discrepancy? Emmanuel: A little bit more– quite a bit more but to be able to say the word made in America and have turnaround time in four weeks is pretty beneficial to us. Steve: Yeah and then how has quality control been? Emmanuel: It’s challenging in terms of us not being able to go in while it’s being made and that’s mainly because we’re not actually physically in LA, none of us are there. I think they’d allow it if we wanted to. But in terms of the quality we haven’t had any issues with quality. Mainly the issues would come from our limited experience in design like Grace did go to school and she’s learned, but we’re still trying to figure out how a label should be applied you know and making sure that we communicate that well to them, you know the little minutia details. How the stitches should be applied and little things like that. We had one design challenge that we had in our last run where they’d given us feedback that the way we made the label actually adds two weeks to the time to make a slap or for setting that cap which we didn’t know. So we tried to change it by adding a fold but that didn’t really work because then they weren’t able to sell it a certain way, so there was actually a little bit of a lip on the label, it wasn’t sewn down with the fold. So it actually as you pull off the slap it might catch on your hair a little bit sometimes. So some of those– that was more our fault and I talked to them, I was like hey what’s going on, and they said hey that’s what you guys made. We’ve gone back replaced those units and now we’re going with a different label maker who can actually give us the folds that we need. But you know those little learnings I think, working with a manufacturer who works with small business and that was what we stated. So they work with small business, doing limited batches, giving the flexibility to make those kind of changes and correct them. Steve: What was the minimum run that one of these manufacturers demanded? Emmanuel: So for us it was 1000 units. Steve: 1000 units okay. All right it’s not too much. Emmanuel: No, not bad at all. Steve: And in terms of just working with them in terms of fixing things, so would they just make a sample and then you would comment on it, and then they would redo another one? Emmanuel: Provide the materials though, so that’s one thing they didn’t provide. Steve: Okay and where did you shop for materials? Emmanuel: So we went– at first we started– this is not an interesting story. We just went to the garment district and we picked them up almost retail you know it’s– they call them [inaudible 00:12:40] and I’ve learned all this myself the hard way but these [inaudible 00:12:44] you go down there and you pick some material off the show and you just take it right down to the manufacturer and they’ll produce a sample for you. Where that became interesting is that’s how we did it the first time. We sold all our units and didn’t really have exactly what the skew was, what the color was color was, color matching the exact materials and when we went back to produce a round of 5000 units, it was almost completely different colors for the same color we’d chosen if that makes sense. Because the way they work is you take the overruns from larger manufacturers and just whatever is there happens to be there. So there are some colors we couldn’t even find anymore in that district. So we had to go through an actually get a textile wholesaler who is also in LA, Synergy Textiles and now we’re far more standardized with our colors, our patterns, our materials. Steve: And, how many different styles did you launch with? I was just curious. Emmanuel: We launched with five colors. Emmanuel: Yeah just to keep it simple. Now I think we’re up to 11and we’re getting ready to produce four or five more colors and probably three or four more sizes as well, because there was a lot of feedback we got was you know I love the cap, but it’s just too tight or it’s just too big. Steve: Actually that’s another question I had, how do you determine how many of each size to produce? Emmanuel: I’m learning that now. In fact I’m in schedule to go through that this weekend talk through and my sister is actually going to design now in different sizes and we’re going to try again like we did before and just talk to some folks who have different head sizes and see how comfortable it fits. So that that way we try going through and finding sizing guides– I know they’re out there somewhere. I just haven’t been able to find them like with the general public wears what sizes, the average size for head size and things like that which she did a little bit to get the initial one, because it was one size fits all. So now as we get more and more gradual it’s harder and harder to find that information, so if you’re aware of any or if anybody knows I’d love to get some help on that. Emmanuel: For many reasons because I mean you’re sleeping with the cap, so you’re going to be wearing it for an extended period of time, so it needs to be comfortable. Emmanuel: Yeah that’s, you’re getting fancy there sir, but absolutely that would be the ideal for us. So after we get this run done and we’re getting stocked up again, meet these challenges that’s one that’s on our road map to try and work through that would be the ideal, if we could just make it something that’s tied off or stable, we can go back to having less skews because from the operation side the last thing I want is just an explosion of skews to hold here at the warehouse and to track forecasting for it to make and different things like that. Steve: Absolutely, so any lessons learnt that you care to share with the listeners about just about the whole manufacturing process? Emmanuel: Yeah, so give yourself enough time, that’s the biggest thing because we kind of ran into a situation. We had plenty of time in our initial run and everything was great and was sitting in a warehouse, but once it sold out we were sitting there with no inventory and orders coming in, and it was tough to get the manufacturer to work at the pace that we needed. So in those cases I don’t know if it’s give yourself enough time or is it a matter of optimism– gauging optimism and forecasting. If we had more inventory– but again we would’ve had to have known. Emmanuel: So it’s kind of a fringy thing, but for sure give yourself time. It makes it much easier if you show up– like this inventory run we’re doing now, we already have inventory, so we’re going to have to invest a little bit more, and we’re going to make another run early enough, so that we can do the sampling. Now so for our labels we’re going to actually– if we’re changing anything to any piece, we’re going to send it to the manufacturer so he can make it at his scale, at his– in his way and then send it back to us. Emmanuel: We’re starting this early we wouldn’t have the ability to do that unlike our hurry up run, it was early, here is the materials and go. Steve: Sure. Yeah no I mean I think that happens to everybody, like we actually run out of inventory this winter because– and we’ve been running for multiple years because we started selling at Amazon and we just couldn’t keep up with the demand there, so I mean it’s really hard to predict. Emmanuel: Yeah. But at least giving yourself enough time allows you like we talked about that label issue we had. Emmanuel: If we had the ability to at least maybe if we don’t have time, just make enough time for that part. So that way you can see if you made a change, make sure they make it the way you want because just looking at it we would’ve caught that issue with the label. Emmanuel: So even if we rushed– I think that would be the advice I give is always give yourself enough time for sampling. Steve: And in terms of just like a minimum investment to create an article of clothing, how much would you recommend? Emmanuel: So we started– I had some money saved up. Our entire business started with $10,000. Emmanuel: So with that we were able to get the initial run of inventory, get a developer– not a developer, a designer to make our website which is a whole another topic, lesson learned there. And also get the Etsy store set up, get the little mix and match like a printer little warehouse signed up for several such services like stamps.com and things like that. Steve: Sure. Okay so let’s talk about some of the other issues with your business regarding marketing your products. So what were some of the other challenges that you faced when you first launched? Emmanuel: I will tell you they can all probably be wrapped up in one big one, it’s probably just inexperience. Emmanuel: Analytics, the ads, the different things that we can do, social media, we were trying it all. Emmanuel: And we weren’t really tracking it well which we kind of rectified it a little bit now using– being very disappointed with the track of our links and Google analytics set up and some other things. Steve: So I’m just curious since you sell caps like what keywords did you bid on with some of the clasper click tools, and was it hard to kind of differentiate your product when you were bidding on search terms? Emmanuel: Pretty niched kind of words, but the other problem with that is that there wasn’t much search traffic for it. So it was kind of a chicken or egg thing you know do we go with what we want and then not get the traffic, or do we go with one of these high level terms that get traffic but really doesn’t fit for us. So those were a lot of the words that we used satin lining sleep cap, we’ve moved on now to trying other things that are broader as we’ve defined, because we actually did do surveys to get feedback from our customers on what they like about it. So now we’ve moved into more hair care type terms. So things that they say they liked about it is that it minimized dried hair, I don’t have to deal with it in the morning, my tangled hair, frizzy hair. It prevents a lot of these problems, so now we’re using more of those key words for our ads. Steve: I see that’s actually a very interesting point that you just brought up. So people aren’t searching for satin lined caps per se in volume, but they are searching for ways to improve their hair which kinds of just opens up a huge market right there. Emmanuel: That’s probably been our biggest learning over this, it’s just the messaging and the positioning of the cap because we started out trying to set up a satin cap that is fashionable which there’s a very small segment of population that actually knows what a satin cap does for your hair and protects your hair. So we were broadening it out, so the education aspect of it. And then the words that we use and the education that we were doing kind of had to fit in with what they used it for, not necessarily the fact that they had one. So that market– we could go out to that market, but we’re going to have a bigger market, so we needed to go after the problem that this generic satin or silk solves, which is the dry hair or the hair frizzy hair, keeping moisture in your hair, protecting you from the cotton pillow case. And so once we started going after the problem it solved versus you know the product itself, yeah it made things a lot easier to pick keywords that are much higher and terms to search from. Steve: And you can probably end up charging more too because I know– I’m sure there’s a lot of people out there who would be willing to pay a lot of money to have healthy hair. Steve: As opposed to just another fashion item. Emmanuel: And that was one of the biggest things we learnt and the feedback we got from our customers themselves. You know when we are selling to people who already bought a satin cap are competing with very low cost solutions out there, you know a durag which is not a very expensive product and our price point is much higher than a durag. However, the solution we are offering is not a durag, it’s not a satin bonnet, it’s also fashionable cap to that market. And then to folks that don’t even know about the satin it’s kind of fashion as a given, it needs to look good, I don’t want it to look like a satin bonnet otherwise I’ve corrupted satin bonnet. And so now I get the benefits of healthy hair, wear a fashionable cap and really a lot of the messaging we’re starting to build in now is kind of things we are learning is you know when we go pay $120 to get a nice haircut or blowout or something at the salon, it may last you two or three days. But if you sleep with the satin lined cap you’ll double or triple that investment. It will last a week or more of that hair style that you put in. So that messaging you know now all of a sudden if I spend $120 now lasts twice as long that’s 2o, 40 bucks. If you can actually do that math it’s like an investment of $30 in a slap isn’t that much. And I can do this over and over again for months, and that’s a drop in the bucket compared to the benefit of the bucks. Steve: So let’s talk about that message. So how did you actually end up finding the medium to get the message out about your products? Emmanuel: The medium– so for us it was YouTube. Emmanuel: YouTube has been the biggest benefit for us and not even like ads on YouTube; it was pretty much getting sponsored videos. So like I said I don’t have much hair, I’m not really big into the hair care space. So it was really– the next thing was well can I find people who look like that. And then add in can I find people who have hair, who have this problem and also have their own audience who they engage with visually. YouTube was the perfect platform for that. and I wish I could say that I planned it that way, but it was one of you know 20 different things we are trying and it took off. And we had several YouTubers reach out to– not reach out but we reached out to them and they agreed to wear it. They talked about how the slack has become a staple in their routine. You know it went beyond just a satin bonnet or durag or a cap and it became this is what I used to keep my hair from freezing and tangling, and I use it in my routine every four days. You know when I wash my hair this is what I wear afterwards. You know they made it very clear how that someone who has never even heard of this or even seen one, could engage with and use it to solve a problem that they have. Steve: So can you kind of go into depth about the process, like how did you find the people to reach out to and then what did your initial contact look like and how did you get them to actually endorse your product? Emmanuel: Sure and that’s– there is two different ways we did it. Now the first one I’ll go into is just the manual time consuming kind of we went door to door basically. So went on YouTube, we found personalities we thought would fit great with our brand, fit great with the product that we were looking for and would get into the healthy lifestyle. And then we just went to the about section and then just click send them a message. But before we did that we actually crafted an email. So the email itself we had had in there who we were, what we are doing, how excited we were about this opportunity for their viewers– we tried to close it on their viewers. Viewers would like this product. We think it will be a good fit. And then we actually created our own YouTube video where was my sister basically saying you know I love your brand, thank you for even being interested or taking the time within this video. I would love to partner with you in solving this problem for you and your viewers. So we hit the send message, sent it to all of them. We did it for 32 when we initially launched on September. We didn’t hear anything back for almost two months, like it took a while. And then we only heard back from about three of them. And one of them actually was the only one who said yes he admired us and we want now to give it a shot. And she was the one that really built our business because she had a subscriber base of about 250,000 subscribers. Put in the video and was very passionate about. She in fact I’ve just got an email from her the other day. She still uses the product. She really liked it. And that came through in the video. Steve: So you sent out 30, 10% responded and maybe just– you had a 3% hit ratio on someone who actually create the video to endorse the product. What was in it for the YouTube person? Emmanuel: So in that respect, in that instance there was nothing upfront. Emmanuel: And at that point we had seen the result of the first one, so $500 wasn’t much of an issue at all, so yes please do it. And sure enough we had– I think we are getting a 10X ROI on each of those videos. Steve: Yeah actually can we comment on what happened after that first video once it went live? Emmanuel: She did the second video. We actually were over 100 a day. And within in less than a week we had sold out all of our inventory. And then the December video and it gets kind of muddy, I can’t really tribute exactly how. But I know with all the YouTube page stuff that we did, we were also tried to work with FameBid and you know they’re like 1,200 bucks. One made $24,000 that month. Steve: So how does it work? Do you give them some sort of special tracking link or a coupon code, like how do you track these sales? Emmanuel: And that goes back to the lessons learnt about the tracking. At the time I didn’t track anything at all. Emmanuel: So now we are starting to do that. For every video that gets made, they get their own specific tracking link so we can see exactly which traffic came from YouTube, from that You Tuber and from that video. Steve: And there is really no way for someone to actually click on something, right? They actually have to type in the URL on their browser. Is that right? Emmanuel: For the YouTube video? Emmanuel: No they– in the comments box, they can actually have the link and so they can put now here is what this video is about, here is a transcript and then here is a link to all the products in this video. Emmanuel: What we did see was there was a lot of direct in Google analytics. A lot came from direct during that month. So I’m thinking what happened is they watched it and then a few days later remembered the satin lined cap thing and we have a lot of our search– the highest keyword search where they would get us from the terms satin lined cap. Emmanuel: So my guess is they saw it, they thought about it then came back and bought. Emmanuel: If you watch the video or if you go to their channel– not the actual video, the channel there is an about section. And so they’ll have– I think it has a little like send me a message button or sometimes what a lot of them will have if you get into the YouTubers who have 20, 50,000 subscribers. They’ll let you have their business inquiries email here. They will work with a multi channel network. Emmanuel: I’ve run into a lot of those which were agencies, which those can be pretty hostile because you’d rather pay the YouTube fee and also the agency fee as well which can be pretty high. Steve: So you mentioned that it took several months for one of these people to respond. So and I understand this is actually a large part of your strategy today. So how do you kind of streamline the process so that you are constantly getting mentions? Emmanuel: Sure and that was another one we would get– we heard from a friend of ours you know that there was a site called FameBid. And so that was one thing we started doing in November kind of low key. That’s where that extra you know 6, 700 bucks came from is we just put out basically your own the website. You put out a campaign saying we are a brand looking for YouTube personalities. And so they put that out, they have a network of about 6,000 personalities they work with, and people bid on your proposal. They send you proposals. So a lot of them came in 90, $100. They’re pretty clear that you know they’re people just kind of up and coming if you have that low bit of amount you can bid. You just send a proposal off from 100 to 250, 250 all the way up over $1,000. So I just said ours are very small just $100 to $250, and I got folks who had you know 10,000 subscribers, 5,000 subscribers. But either way their bids were low 90 bucks, 50 bucks and they would produce videos. So that’s where we had eight of them produced for us. And so at the same time that the lady who was doing the December favorites video that had charged us 500, they were coming out at the same time. So that’s kind of what made it muddy. Well fast forward to January I kind of wanted to re-engage that and go very aggressive with it. So actually when we found out that they have what’s called a brand VIP program where they will actually assign you an account manager who does all that leg work for you. Emmanuel: So now it’s incredible and I’m kind of my goal is to just set a budget of $5,000 every month, talk to other cap manager, and then they go out there and with that budget I think with this budget– just going around she was able to find 11 different YouTubers and really there was very little input from us. She was giving a track of the links and she will give us the videos when they are– she will give us the names of the YouTubers for us to approve, then they will give us the videos when they are ready for us to approve and then they go out. Steve: So I had a question about how you kind of decide which YouTuber will actually provide an ROI for you. Like do you actually screen their videos and do you get an idea of how many people actually view their video once it actually goes live, like what’s the process? Emmanuel: Sure and that’s– part of that whole learning that we did was trying to guess. So we had the initial getting the list of 32. And that was really just my sister who created the product and my other sister is dead. The lady is in the business actually looked at who would this work best for and who can spread it best, and so we just get feel an intuition. And then from that we actually use that same kind of gut feeling intuition for the proposals that came in, because when we put out a proposal we got like 40 something YouTubers that came back, and they all put it in there what they can do for us. And there are six different types of videos you can make. And we just tried a whole bunch of different types, we had favorites videos going out, we had [hall] videos, we had tutorial videos. From that after having about nine or ten of them done, and of course seeing the most successful one that we had, it was a routine. Emmanuel: The videos that work best for us are the ones where someone was saying not, “Hey look what I bought, this is great,” or someone sent this to me. It was someone saying, here is the problem with my head, this product solves that problem phenomenally and I’m going to show you how I use it so that you can you them the same way– a tutorial video. Emmanuel: That worked extremely well for us. So now all our videos that we are having made are just that. Steve: So when these YouTubers make these videos, is your product the only product that’s mentioned? Emmanuel: And if you use something like FameBid you can specify that, like so to take away the FameBid the two videos we had downloaded two personalities. One was a December favorites videos where other products were being mentioned. Actually both of them were. In fact in the original YouTuber she also had other products she basically called it her nightly hair care routine. So at first it kind of seemed like we don’t want to be mentioned with others, but we also had the competing idea that you know we don’t want to have a video just about ours because it would be obviously a sponsored video. Emmanuel: Unless we do a good job. So we kind of wanted to work it in. So it actually worked out well. And so when they had the December favorites where it was just here is a lot of different products, it didn’t do as well as the one that said here’s the products with specific pinpoint. Emmanuel: So if we had three or four shampoos and different things, and then our SLAP as part of that, and so people were going to buy all of them. Steve: So what are the six types of videos? Steve: What’s that first one? Emmanuel: A [inaudible] [00:34:40] is just you know they went shopping and they brought a whole bunch of stuff backward then. Emmanuel: You know they are opening their bag you know, there is get ready with me videos which is kind of like the routine video I’m describing. There is tutorial videos where you are showing someone how to do something. And if you give me a moment I can actually pull it up. Steve: Okay, yeah I’m just curious. This is all new to me, so it’s very interesting. Emmanuel: Okay. Then there is specific like sponsored videos where it’s a video where it’s just you. Just you and your product and that’s it. Steve: Okay. And are they required to say that it’s a sponsored video? Emmanuel: I think so, I’m not sure the rules on that, but I think if they bought it themselves they don’t have to say it’s sponsored video, I don’t know. Don’t pull me on that. Steve: Okay. I think that was what four? Steve: There is two more. Emmanuel: Yeah there is two more out there that I’m working on bringing in. Steve: Actually you can probably just get back to me later on that. Steve: I’ll just put it in the show notes, so it’s cool. So going forward with your business is this sort of influence to a marketer? Is that you are going to be your primary channel or do you have other things in the works? Emmanuel: I’m sorry I missed the question but I actually found them. Steve: Oh you did okay yeah why don’t we– so what were the last two? Emmanuel: There was the review video, a plug mention, a [whole] video, a look book and that was one I forgot, a favorites video and a tutorial. Steve: What’s a look book? Emmanuel: A look book they actually put it on, but we did a few of these as well. They actually put it on and style it, because we are just one cap you know it’s hard to see what will that look like with my outfit. So they’ll do three or four different outfits with the cap on. Emmanuel: With the fame of the platform you are able to just put out a proposal, and then they come back to you. Emmanuel: And I can give you kind of relatively I worked with a multi channel agency for a little bit. And for one YouTuber to do one video was $4,000, one on FameBid it was a 1000 for the same YouTube. Emmanuel: So just the highlight how huge a difference it is when you work with them directly versus through an agency. Steve: Okay, so for that $1,000 how many subscribers did they have? Emmanuel: I think that one was well over 350,000 or 500,000, they had quite a few. Steve: Oh wow okay. So this is like an alternative to television. And it sounds like it’s just as effective or more effective. Emmanuel: I think it’s– the more I read about it and there is others starting again to us, I’m reading other blogs and things, it truly is. And it’s surprising to see how many people actually sit and watch subscriber channels; it’s almost like sitcom television. Every week they have a regularly scheduled post where they put out a video and then in there, there may be even commercials and things like that. Emmanuel: People watch that more than they do TV you know who and other things, it’s incredible. We spoke to celebrities in there and what’s nice is their fan bases are very-very targeted. Emmanuel: So you find one that fits your brand message, I mean it’s almost a slam dunk where you know even if five– 1% of their population actually goes and buys one, that’s enough to hit your monthly quarter at least for us at this stage. Steve: Oh yeah for sure. So the other question that I asked you while you were looking things up was what else do you have in the pipeline in terms of marketing your shop besides the influencer marketing? Emmanuel: Perfect. So we are doing a couple of other things. We learned through that process you know building lists. So we actually– you can believe it, we didn’t even have a email sign up form on our website when we first launched. So we started that and started collecting email address, we got about 2,000. And it’s true what they say about the there is money in the email list because now every two weeks we send out a list an email. And we’re getting probably about a 6% conversion just off of our emails. Emmanuel: So yeah that’s working really well. So we are really being very robust with that. We are tying it to a blog, we actually putting out more blogs. Our own YouTube videos like tutorials and how to wear it and things like that. Then we then send out through email and put it on to our blog and things like that. Steve: So what’s worked the best so far, probably email I would guess. Emmanuel: Absolutely by far email has been the best. Emmanuel: The main focus of our marketing efforts is along with the email and the blogs we are also in the social media. We are really tracking all that, I mentioned being very disciplined with trackable links and things. And I actually was listening to one of your podcasts, heard about mixed panel. So I probably will be getting that started soon just to kind to get a funnel going. And I’ve gotten some of the little bit more experiential landing pages. So for targeted responses to like ads if we start going that round with ads, have very specific you know this is why you are clicking and here is why you are here on the landing page. Steve: Just curious what form of social media is working the best for you guys? Steve: It’s not odd, it’s pour best also. Yeah. Emmanuel: It converts well. We don’t get hardly any traffic from it at all, but it converts really-really well. We get a lot of engagement on engagement front just within the platform from Instagram, a lot from Instagram. Emmanuel: And then we also have Facebook which works pretty well just an all around general you know poster, you can get some clicks through. It hasn’t converted hardly at all for us, but we do get click throughs from the site. And then Twitter we just haven’t really done much on that at all. Steve: Yeah actually Twitter is something I haven’t tried yet either, but from what I’ve heard anecdotally it’s not as effective as the other platforms. Steve: Well that’s cool. So you mentioned “The Lean Start Up” as one of the books that kind of influenced you. Were there any other books as well that you kind of recommend that the listeners read? Emmanuel: Sure, well for every single one of those you know I think I’ve read them all, Lean Start Up, [Inaudible] [00:40:48] now re-brandings coming out and customer development. I have actually been– I used to do a lot of reading books you know kind of game planning and I also love blogs. A lot of blogs running information, Quick Sprout, and things like that to figure out what the social media thing is. And ecommerce field of course I’m on there, there is a lot of clear information, I’m always impressed to see because it’s really niche, right? Emmanuel: There is not a lot out there for a specifically independent ecommerce store owners. So they’ve got a lot of niche content there and SEO models, I take a lot and look at a lot of them, and looks at their stuff as well. Steve: That’s awesome. Well hey Emmanuel we’ve been chatting for a while now and I want to be respectful of your time. If anyone has any questions about influencer marketing or your products, where can they find you? Emmanuel: Sure they can just reach out to me on my email emmanuel@gracerlayer.com, and I’m always more than willing to help out. Steve: Cool and I’ll be sure to link that up in the show notes. Emmanuel thanks a lot for coming on the show, I really appreciate your time, and I’m just really excited with what you’ve been able to do with influencer marketing. Emmanuel: Thank you so much. And if they want to come to the website too it’s Shopslaps.com. Steve: Awesome, I’ll link that up. Thanks a lot for coming on the show Emmanuel. Hope you enjoyed that episode as much as I did. What I like about Emmanuel is that he tried a bunch of different things without success, he didn’t give up, and then he stumbled upon the one marketing technique that vaulted his business to the top. For more information about this episode, go to mywifequitherjob.com/episode57. And if you enjoyed this episode please go to iTunes and leave me a review. When you write me a review it not only makes me feel proud, but it helps keep this podcast up in the ranks so other people can use this information, find the show more easily, and get awesome business advice from my guests. It’s also the best way to support the show and please tell your friends because the greatest compliment you can give me is to provide a referral to someone else either in person or to share it on the web. Now as an added incentive I’m always giving away free business consults to one lucky winner every single month. For more information go to Mywifequitherjob.com/contest and if you are interested in starting your own online business be sure to sign up for my free six day mini course where I show you how my wife and I managed to make over 100k in profit in our first year of business. Go to www.mywifequitherjob.com for more information and thanks for listening. Great show. Would you be able to list the six types of videos that Emmanuel discussed in the video. I am interested in researching the You Tube strategy that he mentioned. Still to listen to the interview, but I just wanted to say I’m pretty happy to see their theme in action. I absolutely love this podcast. If you’re in Nigeria you’d probably have a minimal go at sales trying YouTube. But with what I’ve learnt here, I think implementing the influencers would be great and rewarding. Where I have an issue is this: how many endorsement do you need for a significant increase in sales and from what medium? Great interview. Great to see another immigrant having a go at entrepreneurship, especially since I myself have lived in west africa for a while. Wonderful strategies. You bet, I am going to try out his influencer strategy with our website. Thanks Steve for hosting him.